Are you ever disappointed with your quilt when you are finished? Ooops! Now this was just a case of going too fast! The trusty seam ripper and a flip of the fabric will fix the problem. But sometimes the problem is a little more, and harder to fix – it’s not square, there are tucks or gathers, it’s not the size it’s supposed to be, it’s just generally wonky. It might be time to go back to basics. Even if you are not having trouble, it would still be a good idea to revisit these important habits. 1. Prewashing. Now that’s a whole debate on it’s own (LINK TO PREWASHING POST), but whatever you decide to do, it’s a good idea to do the same thing with all the fabric in a particular quilt. Either wash it all before you start, or don’t wash any of it. Otherwise when you wash your completed quilt, the parts that were prewashed have preshrunk; the parts that weren’t prewashed may shrink more that the rest and skew the whole project. 2. Cutting. 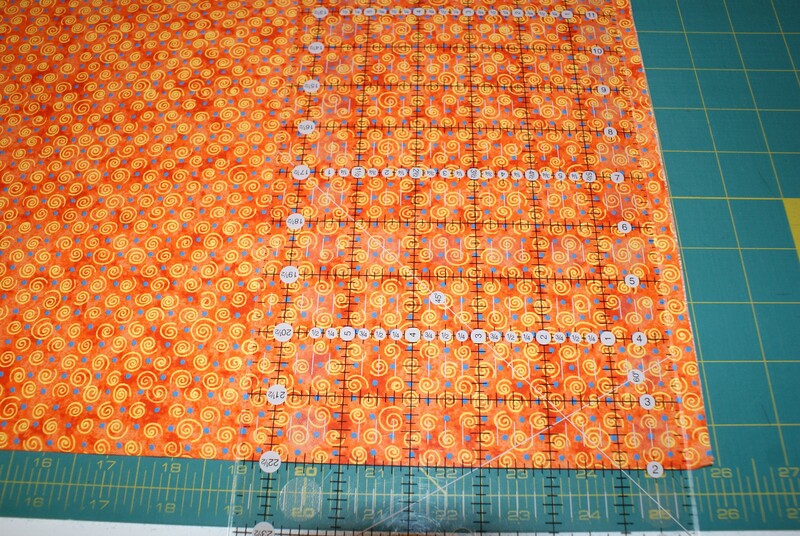 If you need to cut several strips, be sure to square up your fabric after every few strips. It’s not uncommon to be just the tiniest bit off on each strip and then that adds up. The next thing you know you are 1/8″ (or more!) off. It’s also a good idea to keep change your rotary cutter blade as soon as it gets the slightest bit dull. A sharp blade means smooth and even edges. 3. Quarter inch seams – make sure they really are! Being off by just the smallest fraction on every seam can really add up! 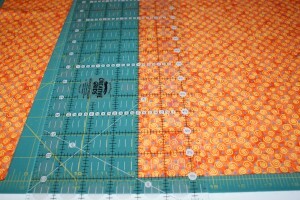 There are several ways to ensure you are sewing consistent quarter inch seams. Choose your favorite way, then stick to it! 4. Pressing. That’s right. Pressing. Not ironing. Always lift your iron as you move to a new section to be pressed. Pushing your iron around the fabric and result in fabric that is stretched out of shape. Even worse, it can stretch your finished blocks out of shape! 5. Pin your borders. When sewing long lengths of fabric together one of them can stretch or get “gathered in” as you go, thereby throwing your quilt out of whack. After you have measured and cut your borders, lay them on your quilt and use several pins. 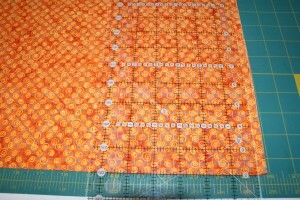 This will ensure that both the border and the center of the quilt will load through your machine evenly. Do yourself a favor and review these before you next project. Then reap the rewards of a quilt well done! You’re working on your first quilt. (HURRAY!) You have your basic tools: sewing machine, cutting mat, ruler, rotary cutter. You have a pattern. And you have your fabric. Time to dive in! Here are a few tips for cutting successfully. Make sure your work surface is steady. If you don’t have a dedicated workspace, your kitchen or dining room table are better options than a card table. If your rotary cutter doesn’t close automatically, always retract the blade and put it in the closed postition before setting it down. Make it a habit. The blade is extremely sharp. Read your pattern cutting instructions all the way through before beginning. 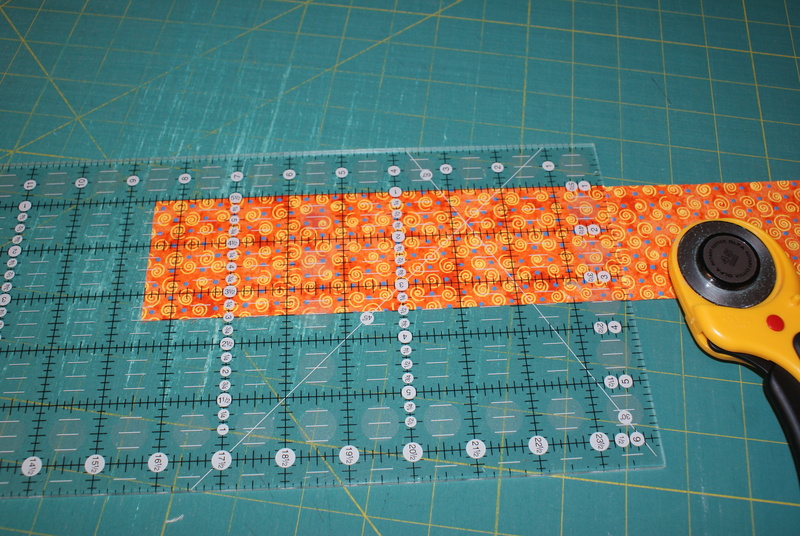 Cut the larger pieces first, then move on to the next smallest and so forth, cutting the smallest pieces last. Some designers includes tips on efficient cutting – use them! 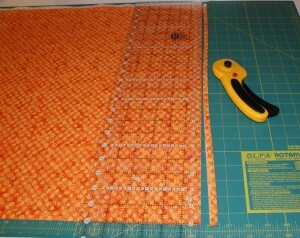 First you will need to square up the end of your fabric to prepare it for the first cut. Fold your fabric in half with the selvedges together and smooth it out. Have the folded edge nearest you. 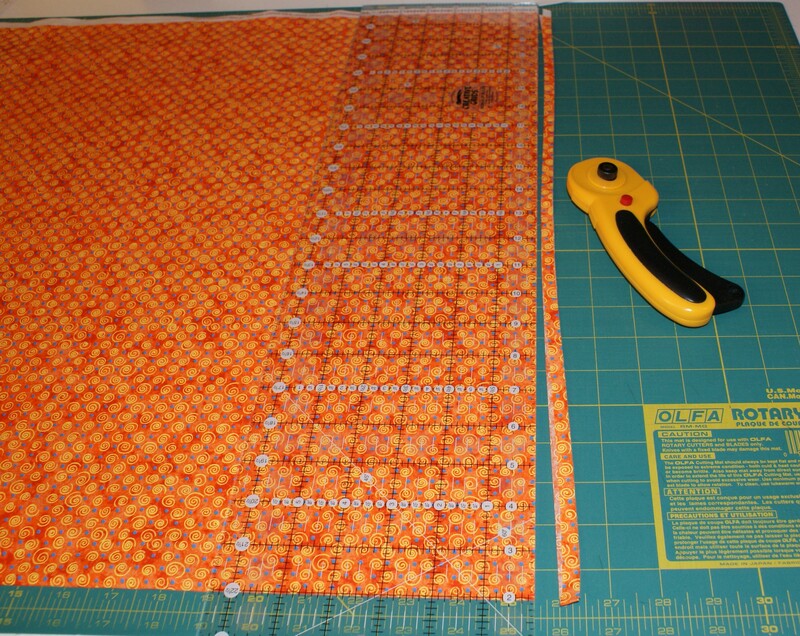 Lay your fabric on your cutting mat with fold nearest you, and the selvedges farthest away. 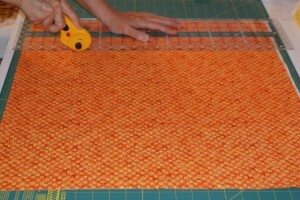 Place your ruler close to the cut edge with one of the lines even with the folded edge. Cut to trim the edge of the fabric straight. Turn your fabric over so the fold is still nearest you but so that the trimmed edge is on the left side instead of the right. Don’t worry about the lines on the mat – you won’t be using them. 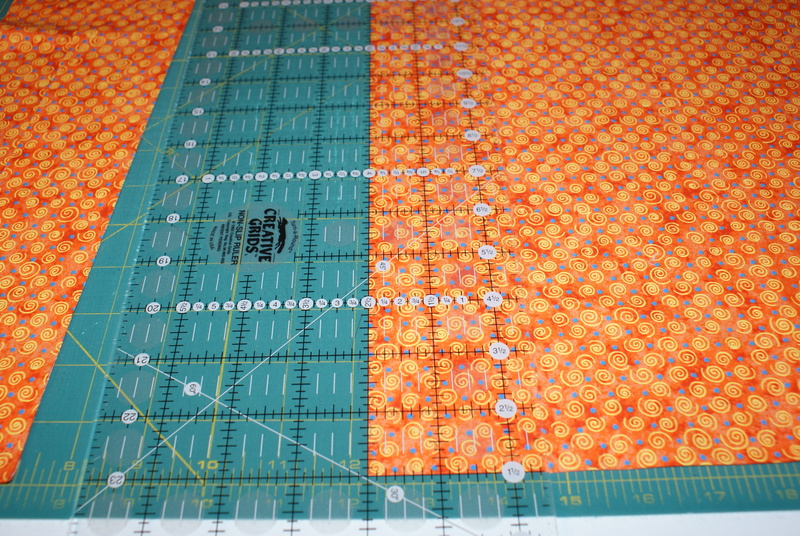 In this picture, a 2 1/2″ strip is to be cut, so 2 1/2″ of fabric is placed under the ruler with one ruler line (the 2 1/2″ line) along the cut edge, and another ruler line (one of the ones that goes across, not up and down) is right along the fold line. 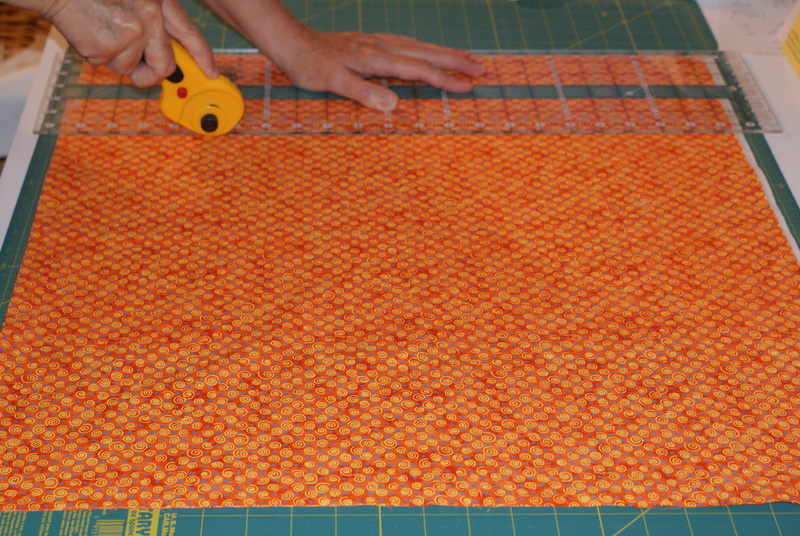 When you need to subcut your strips into smaller pieces, repeat the process of getting one edge straight as you cut off the selvedges. 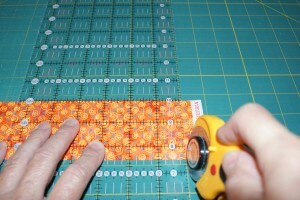 In the picture below you can see that the 10″ line on the ruler is lined up along the edge of the fabric strip. Then turn your strip and cut the correct size. Below an 8 1/2″ piece is being cut. Again, notice a straight line on the ruler lined up along a cut edge. Continue until you have all your pieces cut. It’s helpful to pin a piece of paper to some of your cut pieces so you can easily identify them as you are putting your quilt together. So you have your tools. You have your pattern. And now it’s time to choose your fabrics. Your pattern will list the fabric requirements usually with just a little bit of extra. Not lots – you won’t have enough left over for another project or anything like that. But you should have enough extra so that you can trim your edges straight before you actually start cutting. If you are prone to errors, and can afford it, go ahead and buy a little extra. You’ll never regret having leftovers for your stash! The quilt pattern designer will sometimes make suggestions about the fabric, such as mentioning that a directional print won’t be best. The fabric requirements will somtimes list light, medium, and dark yardages as opposed to actual colors. There are a few ways to proceed. 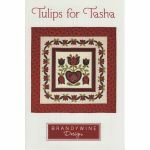 If you are in love with the colors and fabrics that the designer used, you can simply use the picture of the finished quilt as a guide. You probably won’t be able to get the exact fabrics, but you can usually find something similiar. Another option would be to select a fabric collection that you like and choose fabrics from within that collection. 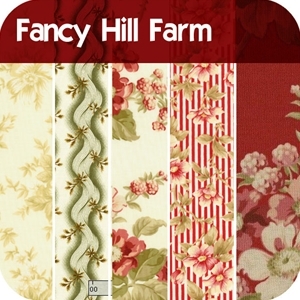 For instance, Fancy Hill Farm is a collection by Robyn Pandolph for RJR Fabrics. Beautiful greens, reds, ivory, and tan in solids, large print florals and small print florals. You’ll find lights, mediums, and darks within the collection and you can be sure that all the fabrics will coordinate with each other. Still another way to go would be to choose from a type of fabric. If you limit yourself to reproduction fabrics, many of the print styles will work with each other. You’ll just need to be sure to select colors that go together. Another option is to choose a print fabric you like that has several colors. 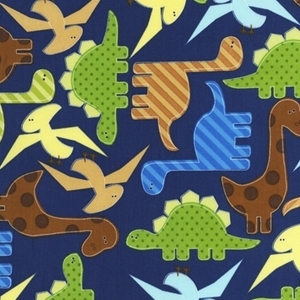 Say you like this dinosaur print but your pattern is for a living room table runner… and your living room decor does not run to dinosaurs! Match the colors in the print with tone on tone fabrics and/or solids in the same colors. Then you can use those fabrics without the print – you know they go together because you already like the color palette in the print. Save the dinosaurs for the kid quilt. Finally, you can skip all the above methods and just trust your artistic instincts (they really are in there). It’s your quilt - express yourself! 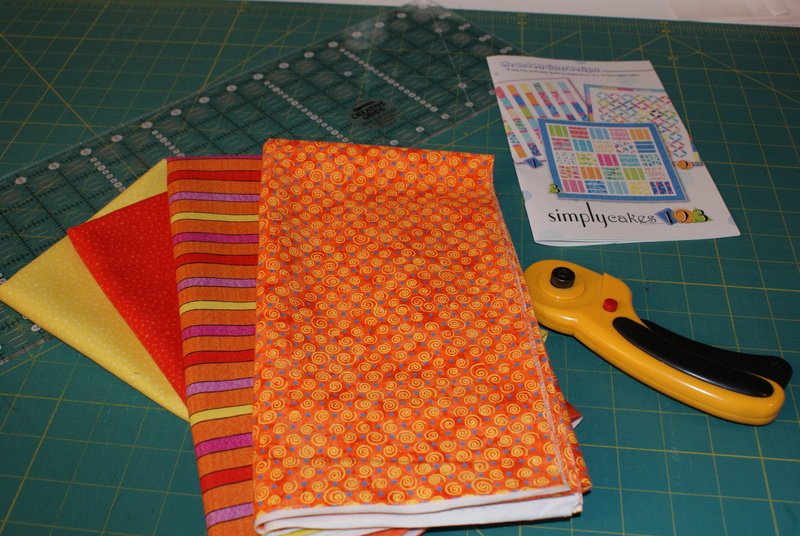 Tools, pattern, fabric…. let the fun begin! So you are ready to make your first quilt. Excited? Of course you are! Choosing just the right pattern for a first quilt will enable you to finish the quilt and enjoy your success. It’s always a good idea to start small. Go for a pattern that features simple blocks and only straight lines, squares and rectangles. Save the triangles for your next quilt. 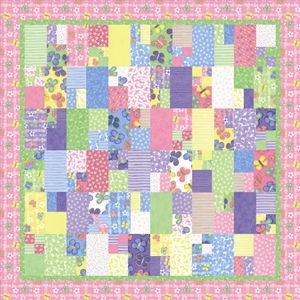 A table runner, baby quilt or lap quilt are all good choices for a first project. 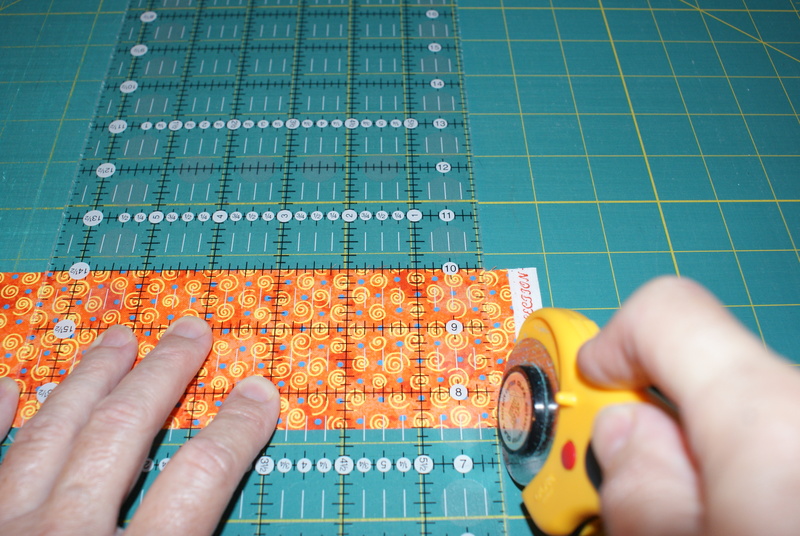 You’ll learn about quick piecing with Ready, Set, Go and the seam matching is kept to a minimum. Finishing at 45″ x 63″ it’s just right for tossing on the couch so it brightens the room. Easy as 10…11…12 is just that easy. 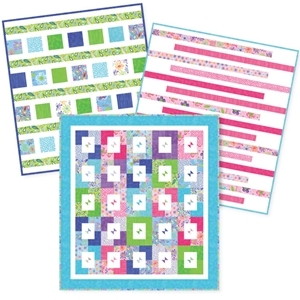 These three quick quilts are in three sizes. The smallest is just right for a baby, the medium for a toddler and the largest for a preteen. 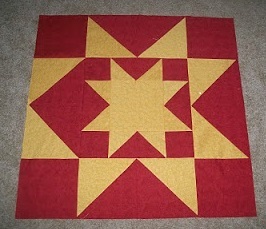 Finish all you and you are going to be so hooked on quilting! Easy Bake isn’t quite as quick as a cake in an Easy Bake oven but it won’t take that much longer. And it’ll be as bright and fun as the fabrics you choose. Turn The Table is a table runner pattern that is so easy but so striking that you’ll probably find yourself using this pattern over and over again. Instructions are included for the “quilt as you go” method, or you can choose to finish it in the traditional way. 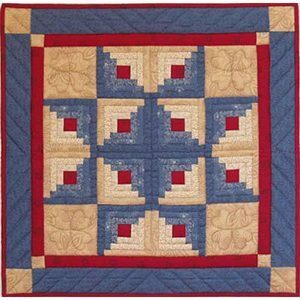 The Log Cabin Star is made with only straight cuts of fabric but you’ll see angles. The log cabin block is so easy and so versatile…. so many different layouts are possible. 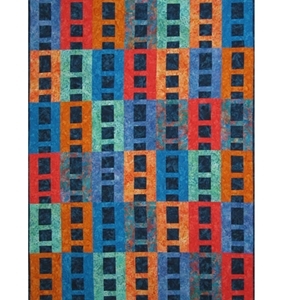 This quilt measures 22″ square. 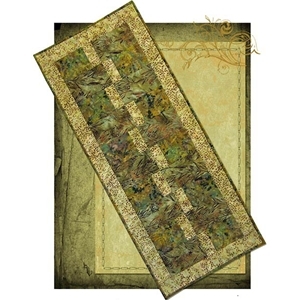 Use it as a wall hanging or a table topper. My first quilt was a log cabin design and the time I spent playing around with the layouts is when I really became hooked. I started too large – a queen size! – but I did finish. The quilt is on the bed in our master bedroom and I still love it, mistakes and all! Go ahead, if you haven’t already, take the plunge! You’ll be so glad you did!